What are we voting on at the upcoming STM? If you think that we are voting on Tuesday night to build a new larger CVS store with a drive-through pharmacy or a new JCrew store, you are incorrect and should read the rest of this article. The vote at the Special Town Meeting on Tuesday, February 3 is solely to approve the proposed zoning change from the current residential zone to a commercial/business zone.... Nothing else! This vote does not involve approval of the actual project details such as the new larger CVS store with a drive-through pharmacy. Town residents will not get an opportunity in the future to vote on the specifics for this project. If this zoning change is approved, town residents will only be able to make comments at a future Planning Board Public Hearing but will not be able to vote yes or no on the specific project. Beginning at a point at the northwest intersection of the existing 20’-0” easement with the property line of Parcel 2 as previously described by a curve to the left having a radius of two hundred eighty-six and 82/100 (286.82) feet, thence EASTERLY on other land now or formerly of Daniel E. Burbank, Jr., et al, eighty and 55/100 (80.55) feet; thence NORTHEASTERLY on land now or formerly of Daniel E. Burbank, Jr., et al, one hundred thirty-one and 90/100 (131.90) feet to land of The First Church of Christ Scientist; thence SOUTHERLY on said land of The First Church of Christ Scientist three hundred and 03/100 (300.03) feet to Williams Street; thence SOUTHWESTERLY on said Williams Street one hundred thirty-six and 16/100 (136.16) feet; thence SOUTHWESTERLY on said Williams Street and by a curve to the right having a radius of five hundred eighty-six and 82/100 (586.82) feet, one hundred sixty-four and 81/100 (164.81) feet to the southeasterly corner of the first parcel of land herein described; thence NORTHERLY on said first parcel of land herein described, three hundred and 3/100 (300.03) feet to a point of beginning. Consisting of 79,230 square feet (1.819 acres). The property is now zoned residential; the shops would like to expand. Currently, business use is not allowed in a residential zone. A zone change to business is needed to expand. This article requires a two-thirds vote. If this zoning change is approved, Grove Property will then move forward with detailed design work followed by a Planning Board "site and design" review. During this review, the Planning Board will make specific recommendations for changes in the design and/or stipulations before they grant approval and issue a building permit. If the Planning Board wants to see specific design changes, Grove Properties can either accept them or take the town to court for mediation of the differences. Many people are voting YES because they want a drive-through CVS or JCrew.... this is not what is being decided on Tuesday night. 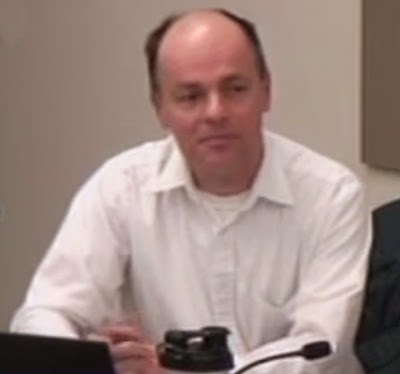 One Longmeadow Planning Board member- Heather LaPorte at the January 7 Public Hearing stated she was in favor of the zoning change because she liked the idea of a CVS with a drive-through pharmacy window. Based upon her comments this appeared to be one of the primary reasons that she voted YES to recommend the proposed zoning change. It turns out that her thinking was not much different from the other Planning Board members based upon their comments. The Planning Board should have been voting on the proposal to make a zoning change for this property to commercial from residential and its impact on the surrounding area not the merits of the proposed project details. In a recent letter-to-the-editor Select Board member Alex Grant wanted Grove Property to put their promises in writing. That is not going to happen. Grove Property positioned the presentation of this project such that they could offer all sorts of "benefits" upfront if town residents voted to grant the zoning change. There is no guarantee that the Grove Property plans as proposed will be implemented. 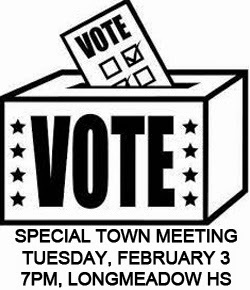 Come as an informed voter to the Special Town Meeting on Tuesday, February 3 at 7 PM in the Longmeadow High School gymnasium. This Letter-to-the-Editor was submitted to the Longmeadow Buzz blog by Alex Grant, town resident and Longmeadow Select Board member. When the Longmeadow Shops zoning change request goes for a vote again on February 3, voters will not be called upon to approve or disapprove the Shops’ expansion plan. Instead, the question will be whether to allow Grove Property Fund LLC or some subsequent owner to pursue commercial development more or less as it sees fit. Even so, Grove Property and its allies have made some big promises: a drive-through CVS, the continued existence of the CVS on Longmeadow Street, and maintaining the farmer’s market in the parking lot of the Shops. From these promises, we have been led to believe that nothing but goodness will come from the zoning change and the expansion plan. There is just one catch. None of the promises I just mentioned are in writing, and they are not guaranteed. If your reason for voting for the zoning change is a drive-through CVS, if you truly believe that the infirm and the sick will benefit from such a mega-pharmacy, wouldn’t it be a good idea to know that such a CVS will in fact occupy that space? When Grove Property came before the Select Board in July, a contract with CVS for the drive-through pharmacy was not in place. 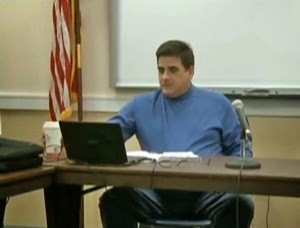 At the November town meeting, the contract was not in place. In January, when Grove Property came back before the Select Board, the contract was still not in place. Nonetheless, the representative of Grove Property tells us that CVS is itching to expand its operations at the Shops and to build a drive-through pharmacy. If that is so, and this expanded CVS is the key selling point to the whole proposal, why is there such uncertainty? The most we have heard is that Grove Property will call CVS after the zoning change is passed. Similarly, Grove Property tells us that CVS has no plans to close its Longmeadow Street location if CVS expands at the Shops. Grove Property’s representatives have said that CVS sees the two locations as two separate markets. But nary a word has been heard from CVS. There is nothing in writing that says that the Longmeadow Street CVS will survive. Finally, we have been told that Grove Property plans to allow the farmer’s market to continue its operations with the new configuration. If that is important to you, why not get that promise in writing? Why not make the commitment enforceable? Business interests like Grove Property and CVS make important decisions when they have signed commitments in writing. We should do the same. Why allow these corporations to change their minds, if these promises are important to voters’ decisions? Make no mistake, Grove Property wants to do a deal with Longmeadow voters. Voters have this one point of leverage to obtain the things that are important to them. Our decision to allow the zoning change would be binding on us and essentially irreversible. In exchange, are we going to accept vague assurances on the essential points of this deal? When handling our own money, we would never enter into an important deal without getting the deal signed and in writing. Why should we be so trusting, so credulous, so careless when we enter into a deal on behalf of the Town? Personally, I don’t see the crying need for this expansion, and I fear that expansion will exacerbate the existing traffic and parking problems at the Shops, especially since a traffic study has not yet been done. I believe that Longmeadow can be a great place to live without this added commercial development, and I also believe that ever-increasing traffic congestion represents the biggest threat to our quality of life. But I recognize that others are more bullish on the benefits of this plan, if it is enacted as it has been presented. If we are going to bear the burden of more drivers on our roads, if we are going to run the risk that this expansion will require other, expensive design changes to the road system around Big Y and the Shops, why not insist that we get what has been promised to us? If we are going to vote for this change because people want a drive-through CVS, let’s get it in writing. If the other CVS location and the farmer’s market are part of this deal, let’s get that in writing too. If Grove Property and CVS cannot put their assurances in writing, then we should vote no. This "letter to the editor" was submitted to the LongmeadowBuzz blog by Paul Santaniello, Longmeadow resident and member of the Longmeadow Select Board. I plan on voting NO on the expansion of the Longmeadow Shops on February 3rd. I plan on voting NO because we are asking to make a decision that will have a long term impact on Longmeadow, without knowing what any of the potential impacts are until we approve the expansion. The process is backwards. At the Planning Board Public Forum on January 7th, there was much discussion of the process. One point hit home more than any other. Paraphrasing a Planning Board member, “we may decide, after the traffic study is done, we may approve only one store instead of three. We would most likely be sued…” In other words, unless the Planning board approves what the petitioners want, we have the potential to be sued as a town. That aside, we have no idea of the traffic impact by adding three stores (four really when the CVS is four times the size of the current location) to the already busy Bliss/Williams intersection. We have no idea of any potential infrastructure improvements that the Town (you and me) will have to pay for to alleviate any potential issues. The process is backwards. It’s just the way it is. I have full faith in the Planning Board to do their best to protect the Town from any potential negative impacts, but once Town Meeting approves the zone change, it places the Town in a defensive position. That is a terrible position to “negotiate” from. If the owner of The Shops wants to be the true blue property owner it claims to be, why don’t they offer numbers as to the potential traffic that the expansion will generate? If they are looking to CVS, JCREW, et al, to occupy the new space, why don’t they ask for the average trips per hour they expect (data the store have) and provide that now? While we talk about a drive thru CVS and all the medical advantages of having one in town, the Manager of The Shops has stated publicly that CVS will not commit to a lease without having the zone change in hand. Nor do we really know any of the other two stores coming in. At Town Meeting, you are NOT approving a CVS. You are NOT approving a JCrew. You are voting on a massive extension of the one of the most traveled roads in town. There is no guarantee that CVS or any other pharmacy will be placed there. Don’t let this misinformation confuse what we will be asked to vote upon. While I believe the process is backwards, I also believe there could be a little more truth in the details of what will actually happen if this vote passes. The Shops have done a great job in marketing the expansion. I just wish they would have spent half as much time finding out and telling us what the facts are. Vote NO on February 3rd.